The term "community property" is one of those that can have somewhat different implications in different situations. In marriage, it means couples equally own their marital assets. In real estate, it's a way of holding title to real property. Community property deeds are only available in the nine community property states: Nevada, California, New Mexico, Arizona, Texas, Louisiana, Wisconsin, Washington and Idaho. Unlike joint tenancy deeds, holding title as community property is an option limited to spouses. 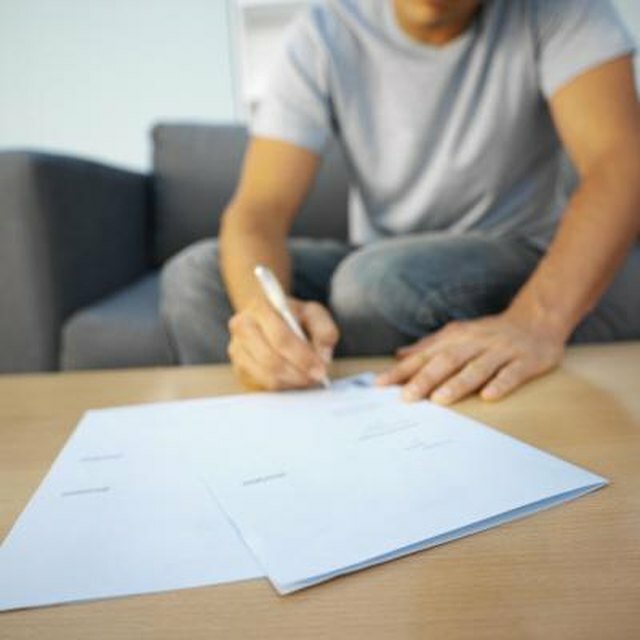 Joint tenancy deeds offer automatic rights of survivorship. If you and your spouse hold title to your property this way, ownership vests entirely in the survivor when one of you dies. Probate isn't required – the deed itself transfers the deceased spouse's ownership interest. If you leave a will stating otherwise, the deed overrides the terms of your will. Community property deeds don't share this provision. Survivorship is not automatic. It occurs only if the deceased spouse makes no other arrangements in his will to transfer his share of the property to someone else. If your spouse dies, you might later decide that you want to sell your property. Whenever you sell something for more than its tax basis – what you paid for it plus improvements – the Internal Revenue Service taxes you on the difference in capital gains. With most inherited property, the tax basis is its value as of the date of death. With joint tenancies, only the deceased's share of the property is valued as of this date. If your spouse dies, half your tax basis is what you paid for the property and half is what the property was worth when he died. In the case of community property, the entire tax basis adjusts to the value at his date of death. Assuming the property appreciated over the years, this can greatly minimize any capital gains taxes that might come due. Under federal law, however, you must only pay capital gains on profits over $500,000 if you sell the property in the same year your spouse dies. If you wait beyond this point, only $250,000 is excluded from taxation. In community property states, spouses are equally liable for all debts incurred during their marriage. Debts acquired before marriage are the responsibility of the spouse who incurred them. If you hold title to your property as joint tenants, your spouse's separate creditors generally cannot reach your half of the house. It's safe from liens brought about by his separate debts. The opposite is true if you hold title as community property – the entire property is vulnerable to both your separate creditors and to those of your spouse. Community property law can be a pivotal aspect of divorce litigation because each spouse is entitled to half-ownership of marital property. If you hold title to real estate with a community property deed, it will receive this treatment if you break up – a court will divide the value of the property 50-50. This is reasonable if you bought the property together, but it isn't to your advantage if you used your separate premarital funds to buy the house. Separate assets are not subject to division in a divorce, but you must prove their origination as your separate property. If you hold title as joint tenants and you can trace your contribution to your separate funds, a court can order that you be reimbursed for this money. You would not have to share it in a divorce.